How do I setup and use Moto Voice? Moto Voice lets you control your phone hands-free by speaking commands. Train your phone to recognize your voice, and it's always ready for the launch command, so it's ready to execute voice searches and unique device commands. Tip: To enable all features and get optimized performance, visit the Play Store to ensure you are running the latest version of Moto Voice. After you train it, Moto Voice is ready for your launch phrase. Just say those words followed by a command or search, and your phone will respond. “OK Google (Now)” will work at any time regardless of the application running. Tip: Please remove the screen cling before proceeding. Move to a quiet room. If your location is not quiet enough your device will notify you. You will only be able to proceed when the phone indicates it has found a quiet location. Once the device is trained you can now use several different voice commands. There is no need to pause after saying the launch phrase. Simply put everything together into a single phrase and Moto Voice will process the command. Moto Voice is able to execute much faster than other voice systems since it does not need to break up your voice command. Say "launch phrase Help Me" for a full list of voice commands and examples, or click here to view on Google. Moto Voice will work with most Bluetooth and wired headsets. To launch Moto Voice simply touch on the talk (Multifunction) button for the accessory, and speak your command, you do not need to say your launch phrase. 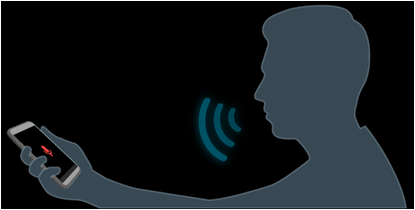 Moto Voice allows you to be as far away as 10-15 feet from your phone, in quiet environments. In loud environments the range is about 1-2 feet. A good rule of thumb is to think of it like talking to a person - if a person couldn't be reasonably expected to hear you then there's a good chance your phone won't either. To use voice pin entry - When Moto Voice is used to execute a command, you simply need to speak your pin code when prompted. Unfortunately you cannot use voice pin entry with a pattern lock or password. Please switch to pin entry if you would like to use the feature. To enable this feature touch > Moto > > Voice > ensure Speak PIN to unlock is checked. What is the “What’s up?” command? The “What’s up?” command reads out important notifications from the notification bar in Android. After reading them the items are marked as having been read for both “What’s up?” as well as Active Display. I can’t get the “What’s up?” command to work properly, what can I do? Alternatively, you can try saying “Read Notifications”. Depending on your particular voice, the system sometimes has a problem picking up a very short phrase like “What’s up?” consistently. Unfortunately at this time you cannot respond with your voice to notifications read by “What’s up?” but we are working on it. How do I reduce the information “What’s up?” provides when my screen is locked? If you are concerned about your notifications being read aloud to another person, you can reduce the amount of detail read by opening > Moto > > Voice Commands while locked > Notification details and turning off the setting. Is Moto Voice recording everything I say? Moto Voice is not recording everything it hears, it's simply matching the sound to your tuned launch phrase. The recognition of your launch phrase is done entirely on the phone. Motorola is not saving anything heard by the phone or the command either on the phone or in the cloud. Where do my commands and searches get saved? How do I prevent Google from saving any information about me? View and edit your ads preferences, such as which categories might interest you, using Ads Settings. You can also opt out of certain Google advertising services. What information is Moto Voice saving about me? Moto Voice is not saving any information about you individually. We collect information about how often you use Moto Voice. Your voice is recorded in order to train the system but it isn't saved. We use your voice to look for your unique "launch phrase" so the launch phrase is tuned to your voice. Once Moto Voice is set up, it deletes your recording so it isn't saved anywhere. How do I use Moto Voice with the lock screen? Moto Voice now includes two new features to make using Moto Voice with the lock screen easier. The first is voice pin entry. If you use a numeric pin code you will be prompted by Moto Voice when you encounter the lock screen to speak your pin. Simply say your pin code to unlock the phone to complete your request. The second feature is to allow the Google application to run in front of the lock screen without needing to unlock the phone. Note: Unfortunately you cannot use voice pin entry with a pattern lock or password. Please switch to pin entry if you would like to use the feature. In order to disable Google Now from running in front of the lock screen, you need to disable running widgets in front of the lock screen within your corporate device policy as part of the Google Apps Device Policy. In order to prevent voice pin entry from running, you need to disable allowing users to use a pin to unlock their phones. How do I choose a contact when I get multiple matches? To call someone after multiple matches either tap on the contact or say call after Moto Voice has read off the contact. Why do I get a match to my phone book when I try to call a business? To improve overall call accuracy, Moto Voice may favor entries in your phonebook over the names of individual businesses. To call a business outside of your phonebook simply say "launch phrase", find the number for <name of business and location>". Google will try and find the right number for you. Why won't Moto Voice call anyone in my phone book? It can sometimes take a little bit of time before Moto Voice is made aware of your phone book after a large import of new contacts. .
Why does the calling interface look different sometimes? When a command is not understood by Moto Voice, the request is sent to Google Voice Search. Google Voice Search then matches it to a card. Why do I need to unlock my phone in order to place a call? Moto Voice allows you to call without having to unlock your phone out of the box. If you turned off Calls in the "Commands while locked" in Settings then you will have to unlock each time in order to call. Why is Moto Voice having a hard time recognizing a name? Moto Voice matches names using the language set on your phone. If the name you are trying to find is too far out of the mainstream for that language, try spelling it phonetically in your phonebook. How can I use Moto Voice with another phone application like Skype or Google Voice? Moto Voice opens all applications that are registered as calling applications. Once Moto Voice starts calling, your phone will present you with a choice of which application you want to use. Simply tap on that application to use it for the call. I just added a contact to my address book but I can't call it with Moto Voice. If Moto Voice can't consistently match a particular person in your phonebook try spelling their name phonetically. How do I use Moto Voice to navigate to an address? In order to use Navigation you simply have to say "launch phrase, Navigate to <address>". In addition to an address you can also say things that Google could recognize like "launch phrase", Navigate to the Post Office in Sunnyvale California". This works great for businesses as well. Why doesn't Moto Voice navigate to my home address or other contacts in my phonebook, even though I have addresses in them? How do I set up the location for Google Voice Search? To set up the location on Google Voice Search either follow the prompts when it requests you to add location permission or do this in the settings. You can find the settings by going inside the Google application to Settings -> Privacy & accounts -> Google location settings -> Access location. Moto Voice isn’t responding after I say the launch phrase - what should I do? There are a number of potential reasons why the phone doesn’t respond to the “launch phrase”. Ensure you are running the most up to date version. Sometimes the phone simply doesn’t hear you because there’s too much background noise, or the microphone is covered, or you’ve said “OK Google Now” significantly differently than how you trained the phone. Perform a clear cache on your device and repeat the steps above. I forgot my launch phrase. What can I do? If you have forgotten your launch phrase you will need to retrain your phone by going to > Moto > > Voice > Manage launch phrase > Change or improve launch phrase. Will a case or a screen protector affect performance of Moto Voice? A case or a screen protector can affect performance of Moto Voice if it covers one of the microphones on your phone. The microphones can be identified as small holes found on the phone. For best performance ensure that the microphones are not covered. Why can someone else trigger my phone? While we train the phone to respond to your voice, this doesn't completely prevent others with a similar pitch and cadence to yours. The training though does prevent most other people from triggering your phone. Why can’t I set up Moto Voice? You may be in an environment that is too noisy for Moto Voice to be trained - this is indicated by the noise meter when training the launch phrase. Simply find another location where you can train. Air conditioning noise in particular can cause problems with training your phone. Why is Moto Voice not working in my car? In many cars you can place your phone anywhere and Moto Voice will work just fine. However, if your car is particularly noisy it's best to have a direct line from your mouth to the phone to work the best. For example, when resting your phone in a cup holder, set it the phone's bottom facing up. Why does Moto Voice not know the time? This is most likely because you are not sharing your Location with the Google app. Turn on location permissions by opening Settings -> Location Access and turning "Access to my location" on. You also need to agree to either GPS or Wi-Fi location. My Moto Voice sometimes launches even though I never said “launch phrase”, what should I do? This is an uncommon experience and can be caused by a poorly trained launch phrase. If this is happening frequently, try going to a quiet spot and retrain your phone by going to > Moto > > Voice > Manage launch phrase. Why do some of my commands simply result in a search query? Both Moto Voice and Google Voice Search work by associating what you say to a specific command like the weather, time, calling, etc.. If there isn't a command or special response for your query Google Voice Search will return a web search result. How come an answer is spoken back and sometimes it isn't? Why can't I play the media on my device?